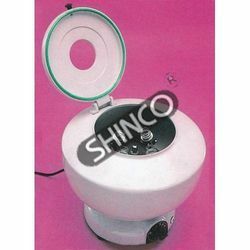 Our product range includes a wide range of laboratory scoop chemical scoop scoopula, support extension plain rings, alcohol burner lamp, glass, filter pump aspirator, litmus paper and support stand, rectangular, cast iron bases. 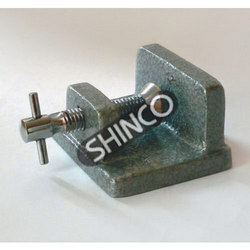 Consists of a flat circular cast iron plate with integral boss head and plated thumbscrew. Inside diameter of the rim 127mm (5in). Can be clamped to rods up to 16mm diameter. 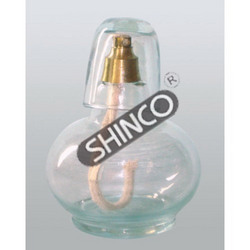 Made of molded soda glass with tightly fitting sealed brass cap. Alcohol is poured by removing threaded brass wick holder. Equipped with a glass cap for extinguishing the flame and to prevent evaporation of alcohol. Capacity about 125mL. 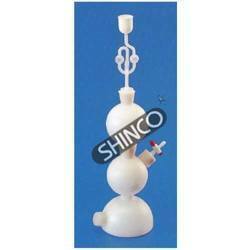 For vacuum filtration and other low vacuum laboratory applications. With 9mm serrated inlet nozzles. Designed to prevent turbulence. In pack of 100 loose leaves. Rugged base for stability. Base drilled and tapped on the edge (except the 300 x 150mm base, which has two holes). 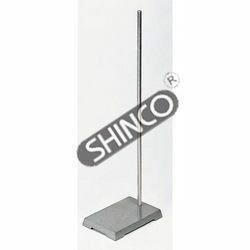 Plated steel rod can be unscrewed from the base for storage. Chemical-resistant, baked enamel finish. Undercoated. Base size (I x w) mm (in) Rod size (d x l) mm (in) Cat. No. 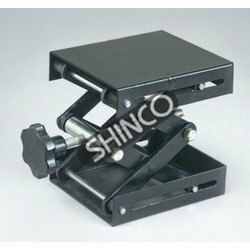 Heavy cast iron base with three point support for stability. 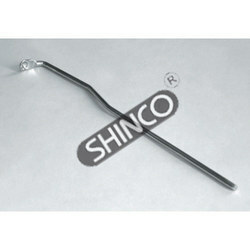 It is drilled and threaded to accommodate a plated steel rod. The base is finished with chemical-resistant enamel paint. Size is the distance from the center of the base to the end of the tripod foot. Size mm (in) Rod size (d x l) mm (in) Cat. No. A PTFE stopcock is provided for the release of H2S gas. 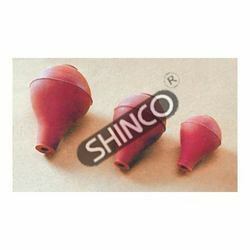 Supplied with thistle funnel and delivery tube. 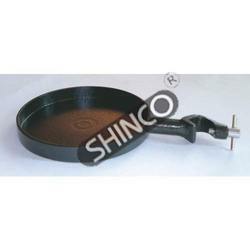 Consists of a flat circular cast iron plate with integral bosshead and plated thumbscrew. Inside diameter of the rim 127mm (5in). 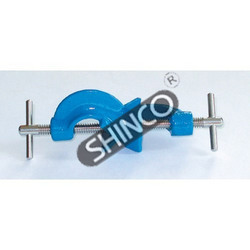 Can be clamped to rods up to 16mm diameter. For identification of oxygen and similar gases which support combustion. 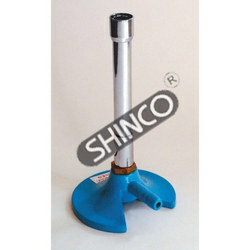 For supporting various sizes of crucibles, and apparatus. 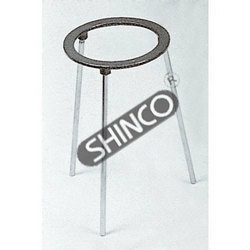 Consists of a circular tripod stand with two removable concentric rings. 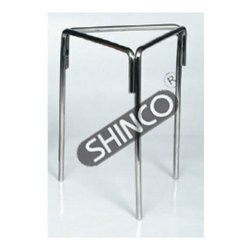 The plated steel legs are detachable and sloped outwards for stability. Outer diameter of the ring is 150mm (6in) and overall height is 220mm (8 5/8in). Black enamel nish. Shipped unassembled. 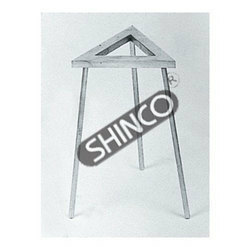 Triangular shape top with each side approximately 125mm (5in) and detachable legs sloped outwards for stability. Overall height is approximately 220mm (8 5/8in). Made of plated steel. For connecting two rods at right angles forming L or T shape. Made of die-cast alloy with plated brass thumbscrews. 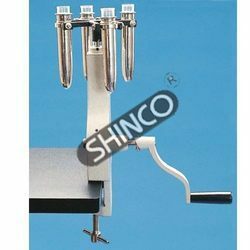 It can accept or be clamped to rods up to 18mm diameter. 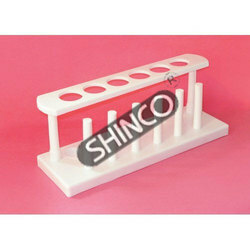 For providing a grip on objects of diameter from 2mm to 90mm. Four pronged clamp of cast alloy with brass thumbscrew and cork lined jaws. 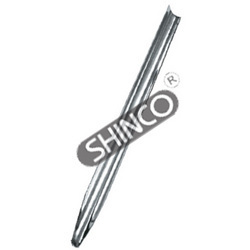 Overall length approximately 240mm. Hand driven, as the name suggests. It has a integral clamp for fixing on to a table. With plastic metal buckets to hold up to 15mL glass tube . Useful for safely drawing liquids in a pipet. 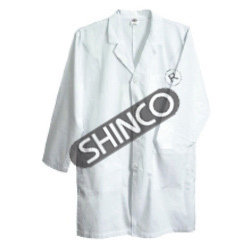 It is chemically resistant. Overall height mm (in) Cat. No. Side x height Cat. No. Uses a device for combining a flammable gas with controlled amounts of air before ignition; it produces a hotter flame than would be possible using the ambient air and gas alone. The Bunsen Burner consists of a metal tube on abase with a gas inlet at the lower end of the tube, which has an adjusting valve; opening in the sides of the tube can be regulated by a collar to admit tube can be regulated by a collar to admit as much air as desired. The mixture of air and gas (optimally about 1 part gas to 3 parts air) is forced by gas pressure to the top of the tube, where it is ignited with a match. it burns with a pale blue flame, the primary flame, seen as a small inner cone, and a secondary, almost colourless flame, seen as a larger, outer cone, which results when the remaining gas is completely oxidized by the surrounding air. 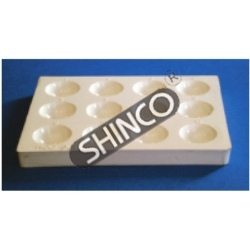 Die casted Zinc base. 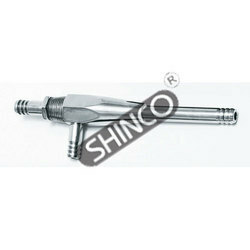 For use on support rods, lattices etc., upto 13mm (1/2in) diameter. With integral boss heads. Distance from center of ring to center of boss head is 10.5cm (41/4in). Brass thumbscrew.Enamel finish. 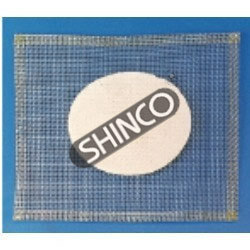 Similar to 2073-01 and recommended for use in test tube of size (Ix d),150 x 24mm. 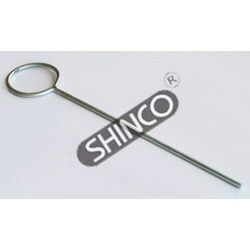 Diameter of the spoon is 6mm and overall length approximately 210mm. Made of stainless steel. 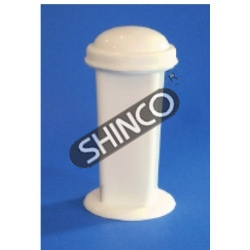 Supplied without disc and test tube. 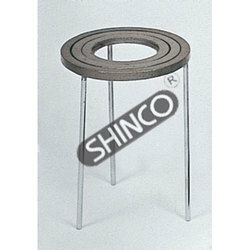 Consists of a base made from 3mm thick steel sheet with rubber feet for stability. The base has a hole drilled, close to the edge (except the 300 x 150mm base, which has two holes). Supplied with a plated steel rod which can be easily screwed to the base for storage. 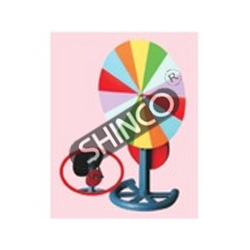 Which has black enamel finish with an undercoating on the bottom. Rubber sleeve provided to cover the edges of the base. 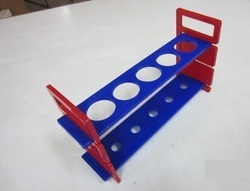 This brightly colored blue and red plastic test tube rack can hold 5 large test tubes. 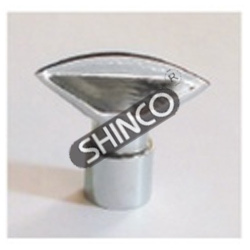 Hole diameter: 1-3/16" (30mm). Quickly assembles and disassembles for storage. Ideal for those larger test tubes like the baby soda bottles. 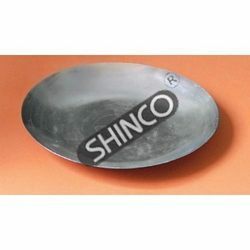 Galvanized iron, shallow form,140mm dia. 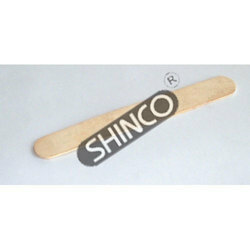 Supplied in pack of 10. 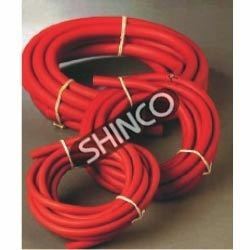 With sincerity and hard work of our professionals, we have carved a niche for ourselves in this domain by offering best grade Rubber Tube. In order to ensure the compliance with the well-defined quality standards of the industry we manufacture these using premium quality raw material that are sourced from the most trusted vendors. ID (mm) Wall Thickness (mm) Cat No. Substitute for porcelain tiles. Made of strong, white, unbreakable plastic and has 12 depressions. Washable. For holding flat object upright. Cast iron, enameled base with steel thumbscrew. Distance between the jaws is 3.4cm and the height of the jaw is 4cm. Dimensions: (I x w), 9.5 x 7.5cm. 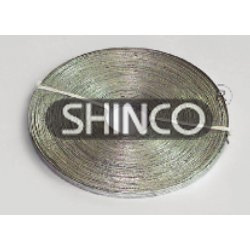 Made of galvanized/stainless steel woven wire with edges carefully turned over. 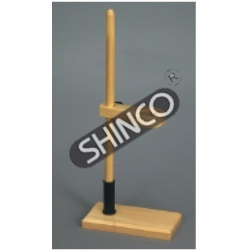 Made of plated sharpened brass tubing with attached handles including a steel punch. Diameters of the holes made, start with 5mm increasing as shown in the following data table. 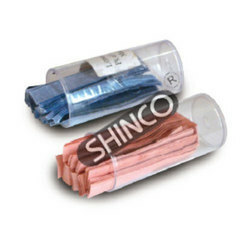 For obtaining broad, fishtail flame that heats large area and smoothly bends glass. Also useful for flame tests and paint stripping. Made of brass. Fits over a range of burner mixing tubes. Outer diameter mm (in) Cat No. For combustion experiments. Thickness 0.03mm. Flammable solid. Cannot be shipped by Postal Service. Sold only to businesses.